AM I ANTI HINDU ? I have the rare privilege to be the most abused person on Social Media by the Sanghis and the paid professionals hired by Modi operating from Sanskar Dham in Manipur Sanand near Ahemdabad. 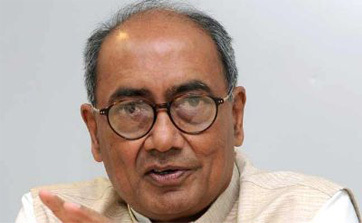 I have been called Dogvijaya Singh some time Pigvijaya Singh by the above mentioned "Gang" who would probably be younger than my grand children! Some time I am supposed to have converted to Islam and some time to Christianity. Blatant lies which the Sanghis are tought to spread during their training as their Pracharaks. But I dont blame them or their parents but blame the Sanskar imbibed in them at Sanskar Dham or at RSS Shakhas. I am the Chairman of a Trust which is running a Ved Pathshala at Hanuman Temple at Awan near Raghogarh . There are over 80 students who are being tought Yajurved and other Vedic Rights all free of cost. My mother was deeply religious and inculcated religious values in all of us 5 siblings . She taught us to respect all religions and love and compassion for all human beings. She kept a fast on Ekadashi all her life. We have imbibed these values from her . I keep fast on all Ekadashis. All night Kirtans are held on every Ekadashi at my residence at Raghogarh a practice my Mother started. On every "Dol Gyaras" I walk barefoot for 3 Kms with the "Vimans"
Yet Sangh and BJP and their brigade call me anti Hindu ! A good Hindu would always respect all other religion unlike the Sangh Brigade. My Guru Shankaracharya ji of Dwarka has been unable to explain the meaning of Hindutva which I believe was first used by Veer Savarkar a staunch Arya Samaji who was vehemently against Sanatan Dharm. The intolerance of the Arya Samaj towards Sanatan Dharm is well known . The Arya Samaj does not even allow the use of its premises for religious rites as per Sanatan Dharm. BJP's Hindutatva has nothing to do with Religion but a ploy to dupe unsuspecting Hindus. As a good practising Hindu it is my duty to stand up to all the falsehood the Sanghis and their paid professionals are spreading against Muslims Christians and other Minority Groups. Would all those who believe I am Anti Hindu please take note of this ? Or do they know a more devout Hindu in BJP and RSS? If they do I would like to meet him. I know what I am saying is going to fall on deaf years of the motivated "Sanghi Gang" nevertheless it is my duty to put it on record what I believe in. If you don't believe what I have claimed you are most welcome to be my guest at Raghogarh which is a 3 hours drive from Bhopal and cross check up yourself. I hope all others who have been wrongly influenced by the Sangh propaganda would try to understand me better !